We all experience stress and most of us experience it quite often. We all have busy schedules with a lot of daily demands. The most common factors for stress are money and work. We all need money to provide ourselves with a daily warm meal. However next to your work there are many other demands bothering you; your children, your partner, or even your dog wants things from you. There are demands from work and demands from your personal life, if we add it all up you have to cope with a lot of daily demands. Every-single-day. If you can’t cope with all of these demands, you experience stress. It wouldn’t surprise you that stress leads to headaches, depression, anxiety, heart diseases and even diabetes. That sounds very worrying, but what is stress exactly? Stress originates from physics. “Stress” means the amount of pressure a material can handle when its’ pressurized. Hans Selye (also known of the father of stress) was in 1936 the first one who used the word “stress” on human functioning. However when something is pressuring us and we do not necessarily name it stress. Therefore physics stress and psychological stress are not the same. Selye recognized this and claimed that with stress he actually meant strain. Strain is known in physics as “the magnitude of an external force which produces a proportional amount of deformation”. So if I experience an external force pressuring me and causing personal deformation, I name that stress. Indeed, that is how I would describe stress. We know that stress isn’t healthy. Nonetheless, I experience stress quite often and I don’t think there is anyone who doesn’t experience any stress ever. So is stress really that bad for you? I wanted to find out how stress affected my daily life. What are the effects of stress on my daily happiness for example? I have over 500 days of data to show these effects in the next graph. Figure 1 shows that with every point of stress I become less happy (r=-0.418 p<0.001). I am most happy without experiencing any stress. It’s not hard to imagine that a relaxing day makes me happy. 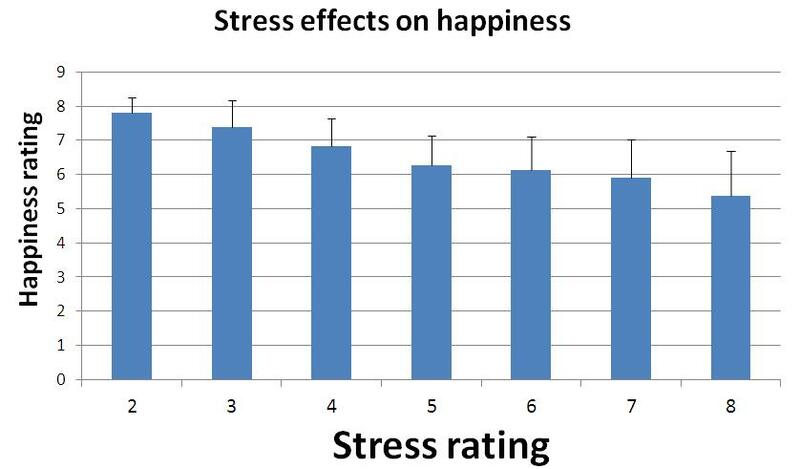 This graph confirms that stress is bad, you get unhappy from a lot of stress. So should we avoid stress as much as possible and relax every day? Maybe we should, but unfortunately it doesn’t work that way. I can’t relax every day. That is mainly because I (still) need to work to graduate and in order to make money. Therefore I want to argue that we need stress to perform. 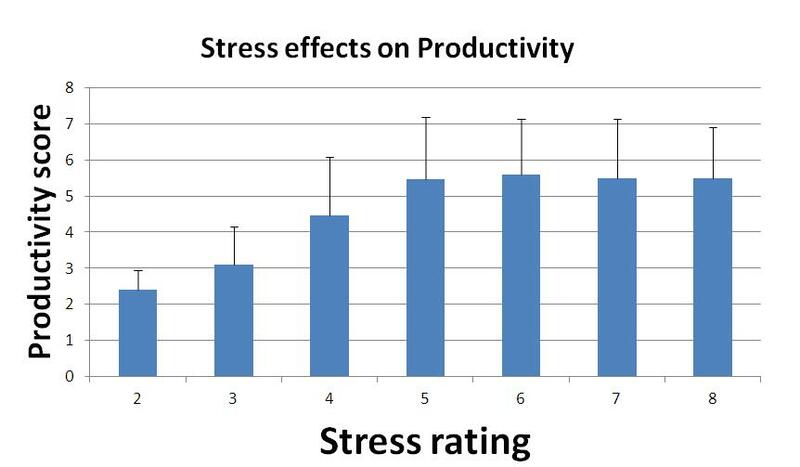 If we look at the effects of stress on my productivity in the figure 2 you can clearly see that the more I experience stress, the more productive I become (until a certain level). In the past two years there were no days that I was productive without experiencing stress. That means that I need stress to become productive. Not too much, but at least some stress is needed. Hans Selye already made this conclusion; experiencing some stress is good for us if we want to perform. Therefore Selye divided stress in eustress (good stress) and distress (bad stress). For example; If you go downhill skiing from a dangerous mountain it causes you stress, however if you managed to ski down safely (with some grace) this is good stress, we call that eustress. However, if you weren’t that much of a good skier, you fell 10 times, hurt your knee and therefore didn’t enjoy anything, you experience distress (bad stress). Distress is known as persistent stress that is not resolved through coping or adaptation. So if you can cope with the external stress, it is good stress (eustress), if you can’t; it is bad stress (distress). Another researcher well known researcher; Csíkszentmihályi invented the flow theory (see next figure). 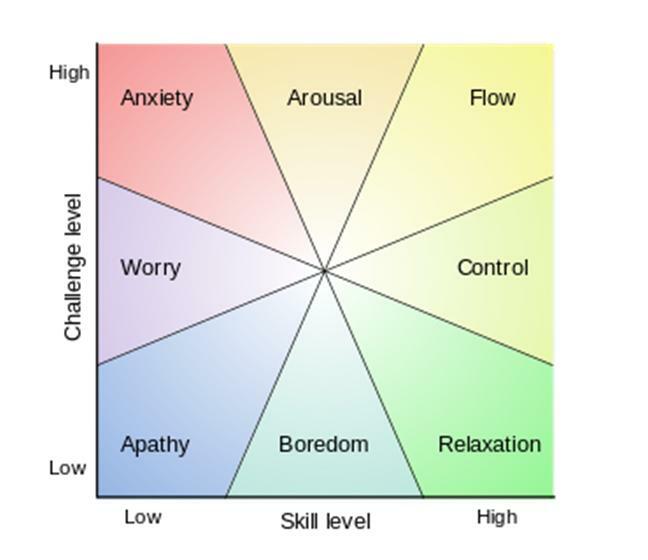 You can compare “flow” with eustress, you are in flow when the challenge is high and you also have high skills to cope with the challenges (like downhill skiing skills). If the challenge is high but you can’t cope with it (because your skills are lacking) you’ll experience anxiety and worry (you are distressed). Why did you make yourself so stressed? Our western society (in contrary to some other societies) is constantly stressing us. We are constantly faced with several challenges and therefore we are experiencing stress often. Once we have the skills to handle our challenges we are in control. Right at the moment we are in control of our challenges we, (or our society) “want to go to the next level” with more demanding challenges. You can see this in our school system, in our work hierarchy, and in videogames. The level of difficulty often increases every time we just learned how to handle something, we are challenged constantly. Usually we enjoy a challenge, but at one level of difficulty the challenges will be too much; we cannot cope with the challenges anymore. At that moment you will experience distress. Nonetheless, the people around you still expect you to handle the situation. You need to work harder to keep up but you can’t. This can cause prolonged periods of distress, resulting in headaches, sleep problems, and risks on burn-outs. If you experience this negative symptoms you might ask yourself; how to deal with distress? How to deal with distress? If we look at the previous mentioned theories you can avoid distress in its core by two ways; the first way is to reduce your challenges. If you reduce the external demands you’ll experience less external pressure. Reducing your challenges is a difficult task because we have our ego. Our ego has a difficult time admitting his inabilities. When was the last time you told your boss: “Sorry boss, I am not capable of doing this, I am not smart enough.”? That is hard for us to do, we want to perform. We have an ego that wants to handle everything. Nonetheless, in the end it might make you happier if you accept your inabilities, than you know what you can, and what you can’t do. By accepting your defeat you might tend to be challenged less or you can accept other challenges that you are capable of. If you can let go of your ego you will be more self-accepting what ultimately leads to more happiness. With less daily challenges you won’t reach the level of flow but you will achieve levels of control and relaxation. That is no problem, but you might get bored of that after a while. The second way to deal with distress is by increasing your skills. If you increase your skills you can better handle the external challenges which are demanding to you. You can take a training course or you can increase your skills by living a healthier lifestyle. By increasing your health you can boost your performance. With better performance you will reach a sense of flow more often instead of the distress that you felt before. I found that no stress at all results in the most happiness for me. Unfortunately I can’t be happy relaxed every day and I think that most of us can’t. I experience stress caused by external demands like the need to get my Master’s degree and to make money. The stress that I experience from these demands makes me productive, I need that stress. By being productive I can cope with the external stress, in that way I feel like being in control or even in flow. Once you have found flow, it seems that you can handle everything. It is likely that you will accept more challenges. However, you should be very cautious that you do not accept more challenges than you can handle. If this has happened you’ll experience distress, and in that case stress is bad for you. You need relaxing non-stressed days to recover from all your external demands. Holidays or day-offs will rock your boat much more if you are very stressed all the time. If you aint have time for relaxation you might go down a worrying path. It would be wise for you to consider if you still like to deal with all the demands you have or to think about a way to boost your performance. Another interesting article. I wanted to play devil’s advocate a bit by proposing that maybe productivity is what results in stress rather than the other way around? I think from your data it’s hard to distinguish that, no? Thanks! Yes that is indeed impossible to say with correlations. However, the nice thing about QS data is that I could interpret this correlation because I know a lot about myself. I don’t think I’ll get stressed from being productive (well maybe a little if everything doesn’t work out). Nonetheless I still think that most of the correlation is due to the; being stressed causes productivity to overcome the stress. I was so confused about what to buy, but this makes it unnlestaddabre.